Recently I got a new lens for my DSLR. I often use my compact camera a Fujifilm Finepix F30 on macro for most of my photography. But I hope to change that. The body of my DSLR is a 9 yr old Canon 300D. The new lens is a Canon EF 50mm f/1.8 II, also known as the plastic fantastic. Here in the Netherlands it costs less than € 100. I don’t know much about photography. I’m still trying to get the hang of the DSLR. Be ready to see more of these snapshots, because I certainly need the practice. 9 out of 10 photo’s are still quite blurry, I really do need to use my tripod more often. 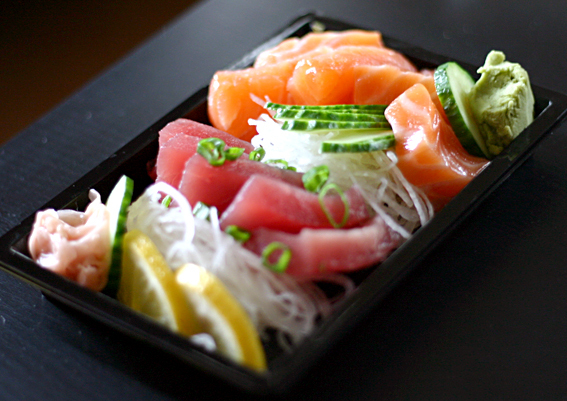 Today’s subjects are the sushi and sashimi takeaway from a local restaurant. 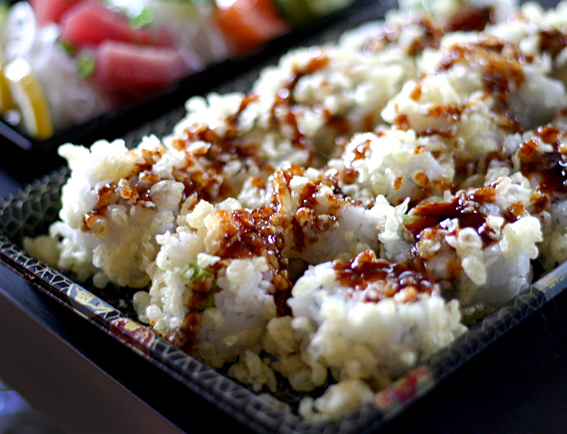 In the photo above you see our favorite, the tempura maki. Tempura prawn and avocado on the inside, tempura scraps on the outside and teriyaki sauce on top. If you have any pointers or helpful links in regards to photography, please let me know!